This is a mat-forming herbaceous perennial with whorled ovate leaves. The flowers are upturned and cup-shaped, yellow with red throats and are borne in the leaf terminal. The plant flowers from spring to summer and is 4 inches in height and 12 inches in width. 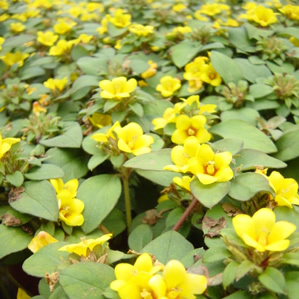 It makes an excellent groundcover and is happiest in full sun or partial shade. This plant also likes damp or moist places but not areas with water that stands. It is very important not to let this plant dry out severely during the summer or damage will occur. This variety has dark green leaves with yellow flowers.